Was a somewhat surprised by last weeks winner, Krups Nescafe Dolce Gusto Single Serve Coffee but then again I don’t know many gadget lovers that don’t also enjoy a caffienne fix, congrats to Single Serve Coffee on their first CGOTW week win. 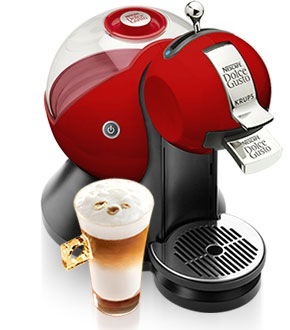 The Krups Nescafe Dolce Gusto not only makes a perfect cup of single serve coffee, it can also make lattes, cappuccinos, shots of espresso, chococinos (hot chocolate), and even iced cappuccinos. And not only does it make an amazing range of drinks, this is one of the first single serve coffee makers to have a “round water reservoir”, and to also look truly different than any other single serve coffee maker we’ve seen. The unique styling puts it on a path of it’s own, and it’s no wonder the design is so different. In second place we have the differently cool bedside table medieval weapon set (this one got my vote). If you live in fear of people breaking and entering your home and you are made of sterner stuff than the guy who needs to sleep with a shotgun under the bed, then this is definitely for you. The safe bedside table breaks into a club and a shield – ready for you to put some serious hurt on whoever is invading your home. Finally in third place we have junior biologists ideal gadget, the USB Microscope. This nifty USB gadget allows you zoom in (from 20x to 200x) on any object you happen to have on hand. It also comes with software allowing you to be a real boffin and record your findings as photos and videos onto your PC. Draw for voting and commenting: Justin (big.j), the first person to win twice in a row, lucky so and so. Draw for telling a friend: Clay(sketchupsbest) who was the fortunate one out of 14 who was good enough to tell a friend about the contest. Thanks again everybody and good luck with the next CGOTW on Friday.